Private bath with separate shower. Sunday - Thursday prices exclude holidays. All rates are per night. Minimum stays and higher room rates may apply during special events (e.g. 2018 Super Bowl). See specific dates. Formerly the maid's chamber, this royal space boasts a flickering gas fireplace seen on one side from the king size bed and on the other side from the large sunken whirlpool tub in the sun porch. 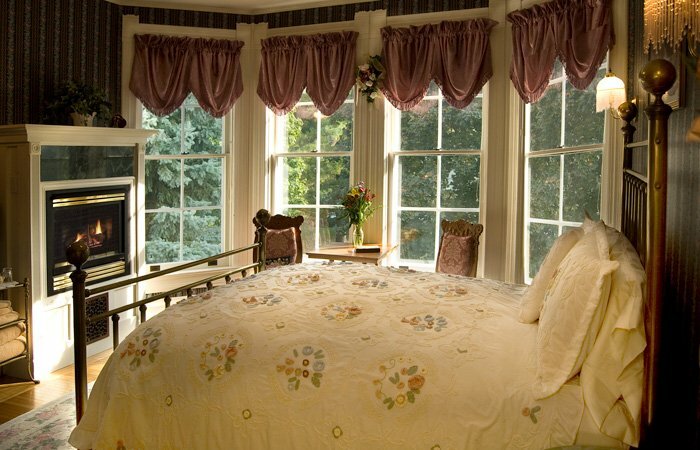 Soak in the original claw foot tub, luxuriate in the double shower, or view the sun setting over the St. Croix River. This room is on the second floor. Maximum occupancy is two people. 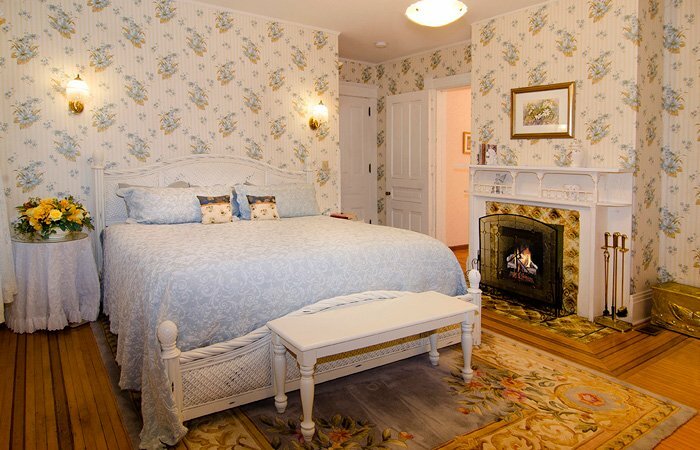 This romantic suite features a king size white wicker bed and original Italian tiled wood-burning fireplace. The whirlpool bath is in the gorgeous over-sized bathroom which also has a separate shower. Look out in all four directions from the windows in the octagonal turret. An abundance of natural light gives this space a special glow. Bridget's Suite was on the cover of "Victorian Decorating and Lifestyle." This room is on the second floor. Maximum occupancy is two people. 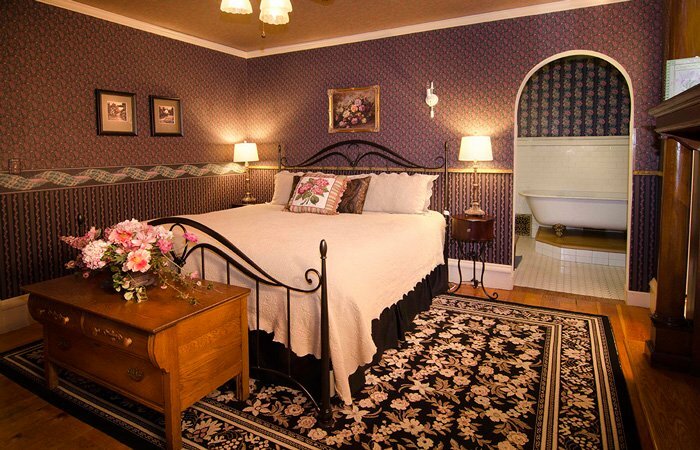 Mr. & Mrs. Phipps slept in this handsome suite featuring an Amish cherrywood king size bed. Similar in size to Bridget's Suite, the Master Suite also has an original Italian tiled wood-burning fireplace and stunning bathroom with a whirlpool tub and separate shower. Climb through the window to a small, private, screened porch and watch the sun set over the St. Croix. This room is on the second floor. Maximum occupancy is two people. 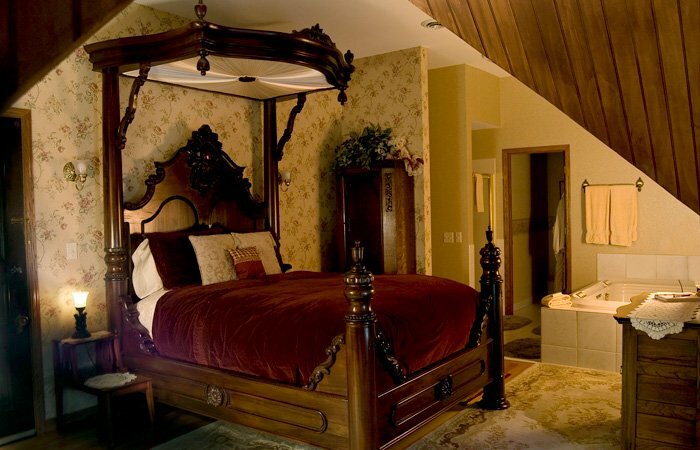 This redwood-paneled getaway offers a breathtaking mahogany half-tester queen size bed. The gas fireplace can be seen from the bed as well as from the extra large whirlpool tub that will delight you with its built-in waterfall. The Peacock Chamber has a separate shower. The peacocks provide an elegant welcome to this delightful third floor room. This is a place you won't want to leave! Maximum occupancy is two people. The Willow Chamber derives its name from the soft willow-colored walls and our proximity to Willow River State Park. 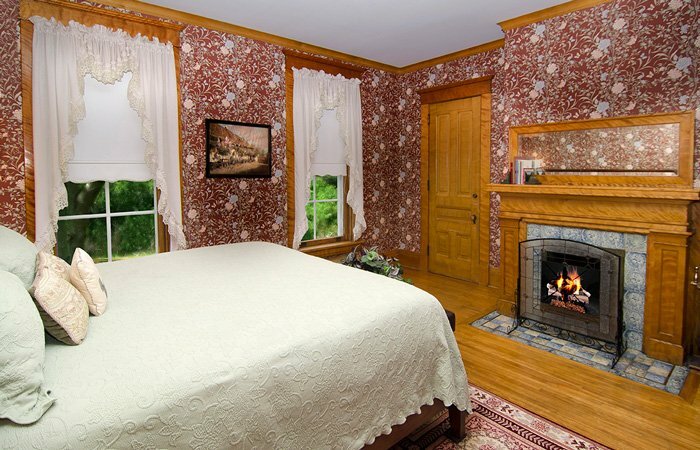 Enjoy the gas fireplace from the wrought-iron, four-poster, curtained queen-sized bed. The double whirlpool tub is under the eaves with a view down to the St. Croix River. You'll have quiet seclusion in this third-floor retreat which also has a separate shower. Maximum occupancy is two people. An intimate and charming retreat with bay windows and a brass bed. The antique furnishings, unique whirlpool bath and shower, and gas fireplace at the foot of the queen size bed are irresistible. 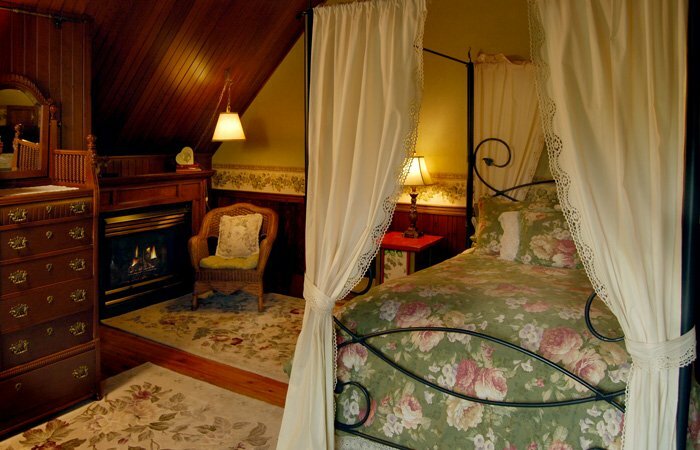 This cozy getaway is decorated in Victorian lace and floral motif and awaits your special evening. This room is on the second floor. Maximum occupancy is two people.